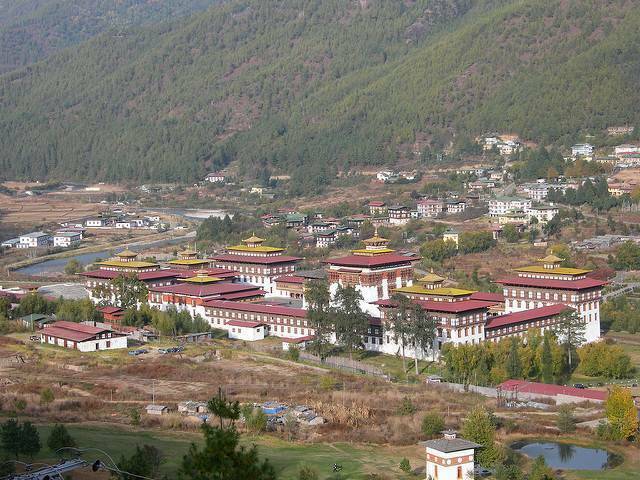 Most tours of Thimphu begin with Tashichho Dzong because of its convenient location in the city. It is an ancient dzong tracing its roots to the 13th century. Amidst the lush greenery and the blooming rose flowers in the garden, stands tall this huge white­washed building with the shimmering gold plated roof, making it a picturesque place for tourists. It is located on the north side of the city on the banks of the river Wang Chuu. This dzong is the seat of power as it has the main Secretarial building, the Throne room, and administrative offices. Tashichho Dzong is also known as the 'Fortress of the Glorious Religion'. The original building was built in 13th century by Lama Gyalwa Lhanangpa from whose descendants Zhabdrung acquired it and renamed it as Trashi chho. Since then there had been several fire accidents and several reconstructions and new additions have taken place. The building was furnished in the present form by the third king of Bhutan, Jigme Dorji, in 1965. Everything was rebuilt except Lhakhang Sarpa, central tower and chapels. Today, the Assembly hall houses a large statue of Shakyamuni Buddha and the thrones of kings. There is a SAARC building across the river that houses the National Assembly and to the south­east lies the residence of current king. The biggest annual festival of Thimphu, Tsechu, is held here. Visiting Hours: 5to 6 PM on week days and 8 AM to 6 PM on weekends.